The Vine is a collaboration with Hufft of Kansas City, and was fabricated by Zahner Architectural Metal. 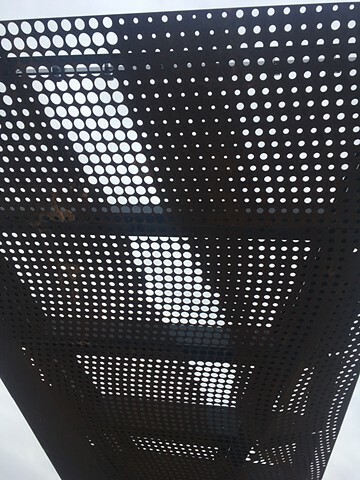 The project involved conceptualizing a solution for perforating the weathering steel panels of a 700-foot walkway surrounding the 8th St. Market in Bentonville Arkansas. I proposed composing the attenuated structure with a wandering line, taking form as a half-tone screen, depicting 14 rivers, streams, and creeks sourced and drawn from the watershed surrounding the culinary center, scaling them and stitching them together as a single contour. The waterways were manipulated to produce the largest perforated aperture so that the shadows cast in sunlight would define the runnels as bright paths of light, creating a meandering ambulatory beneath the canopy.